Sadly, summer is winding down for many. Soon most of the tourists here in Central Florida will be heading home as school resumes and vacations are over. 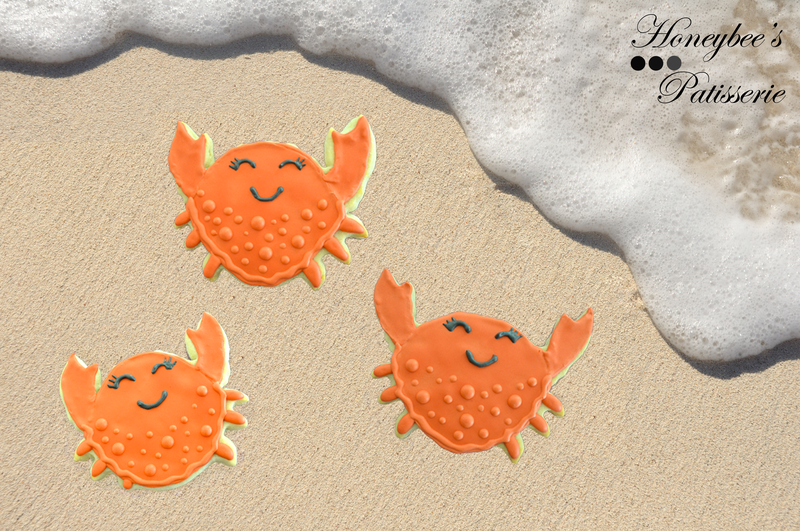 For those that want to take the spirit of warm summer weather and sandy beaches home with them, these crab cookies are perfect for keeping the coastal feel alive. 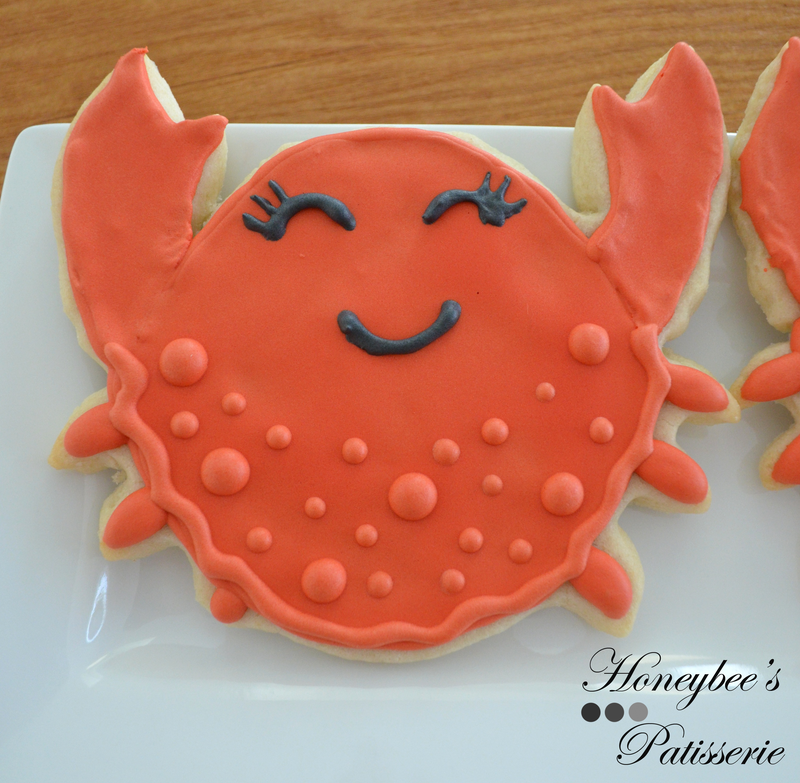 To make these cookies, you will need your favorite cookie dough (I used basic sugar), a crab cookie cutter, royal icing, gel food color, and some decorating bags/tips. I used Americolor Tulip Red and Super Black on these cookies but you can use any red or orange color depending on how you want the final hue to come out. I wanted some to be more red and some to look more orange just to give depth to the plate when presented. You can do all in one shade since it is easier. 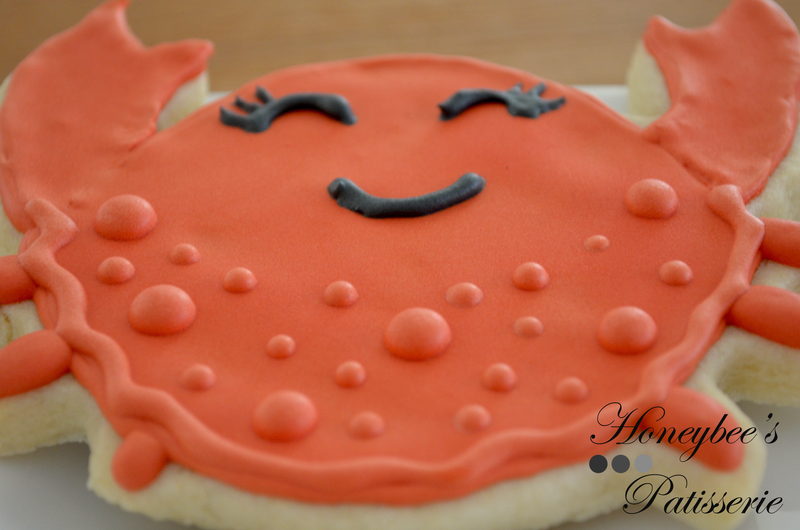 Once the cookies have been baked and cooled, begin by outlining the crab body with the Tulip Red Piping Icing with a bag fitted with a number 2 tip. Once it has set for a few minutes, flood the outlined body with the Tulip Red Flood Icing. Allow the body to dry for a little while and then continue on. Next, outline the claws with Tulip Red Piping Icing and after a few minutes flood with the Tulip Red Flood Icing. Move on to the legs, using the 15-second Icing in Tulip Red. Use a slightly larger tip and gently push out a segment of icing for the leg. Allow the cookie to dry thoroughly before continuing on. Depending upon your location, this can be from 4 hours to 24 hours. Since I am in humid Florida, I allowed them to sit overnight. Once the cookies have had time to firm and set, continue by adding the details. 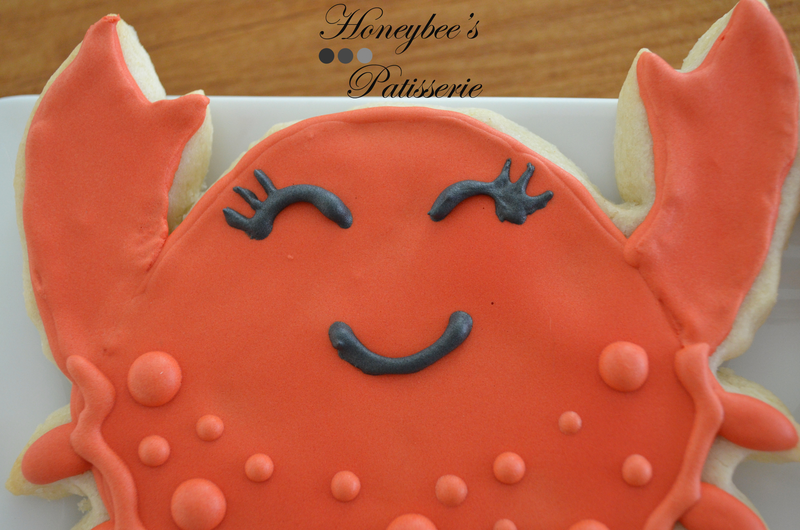 Begin using the Tulip Red piping icing to create a squiggly line outlining the crab shell body and distinguishing it from the segmented legs. Next, using the same piping icing, create varying sizes of dots to add texture to the shell. Press with less pressure for smaller dots, more pressure for larger dots. Lastly, using Super Black piping icing, pipe an upside down larger opened “u” for the closed eyes. Pipe 3 eyelashes on the outer edges of each eye. Finish up by piping the smile midway between the two eyes. Once you have finished allow the cookies to set again before serving. 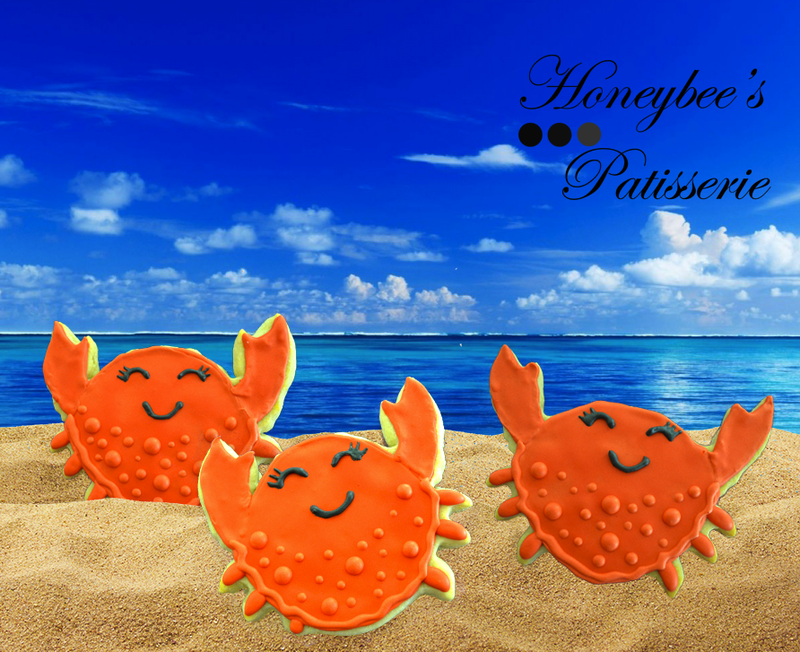 If you are entertaining and want the crabs to look like they are on the sand, spread some Turbinado or Brown sugar on the bottom of the serving platter and arrange the cookies as if they are resting on the sand.